On 21 March 1918, reinforced with divisions from the Eastern Front, the Germans launched a great offensive against the British forces which withdrew across the 1916 Somme battlefield towards the major city of Amiens. The Australian units were hurried south to help hold back the German advance north of the Somme at Dernancourt and Morlancourt. However German engineers had extended rail communications south of the Somme towards Villers-Bretonneux, close to the key city of Amiens. If the Germans could capture Villers-Bretonneux and reach the edge of a plateau, Amiens would be within range of their artillery. 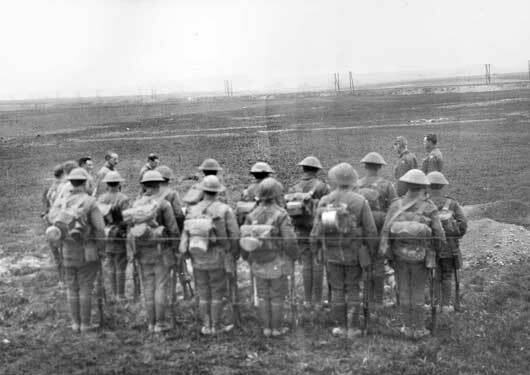 On 4 April 1918, Australian units helped the British defend Villers-Bretonneux. 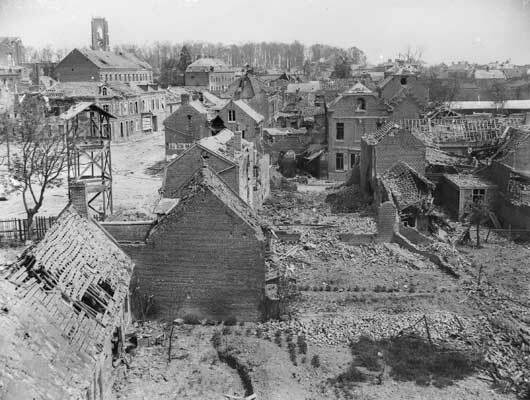 The Germans attacked from the north east forcing the British out of the village of Le Hamel. An Australian battalion had to swing back to avoid being enveloped but the German advance was stopped by British cavalry working with Australian infantry. In the afternoon, the Australians withdrew to the outskirts of Villers-Bretonneux but at the crucial moment, the Australian 36th Battalion (New South Wales) dashed forward in a spectacular charge. Supported by other British and Australian infantry, and later by British cavalry, the 36th threw the Germans back to old trenches nearly two kilometres from the town, stabilising the line. 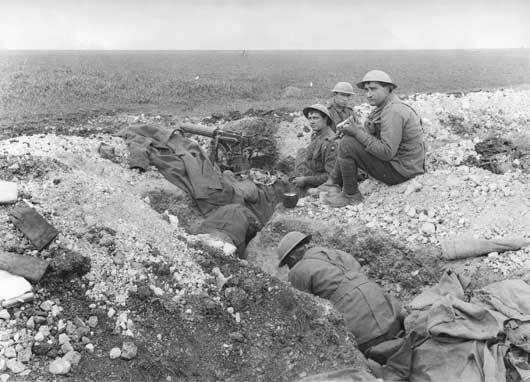 On 24 April, British troops were defending Villers-Bretonneux. The Germans attacked at dawn, and with the aid of 13 tanks, which they were using for the first time, they captured the town. A British counter-attack commenced at 10 pm the same day led by Australians to the north and south. The Australian brigades enveloped Villers-Bretonneux and attempted to join forces to the east of the town. They were unable to join up in the dark and many Germans managed to escape. After dawn, the gap was gradually closed and Australians entered the town from the east and British from the north and west. Villers-Bretonneux was cleared of enemy troops on 25 April 1918, the third anniversary of the Anzac landing at Gallipoli. This action marked the effective end of the German offensive that had commenced so successfully more than a month earlier. Communities in Australia helped Villers-Bretonneux to rebuild after the war, and the Australian National Memorial to those who fell in the conflict stands on the Villers-Bretonneux plateau. To this day, the people of the town annually observe Anzac Day, and the school in the village bears the simple message on the playground wall “Never forget Australia”. The ruined buldings as seen from the window of the South Chateau, in the area that was recaptured by the 13th and 15th Brigades (AWM E02154). 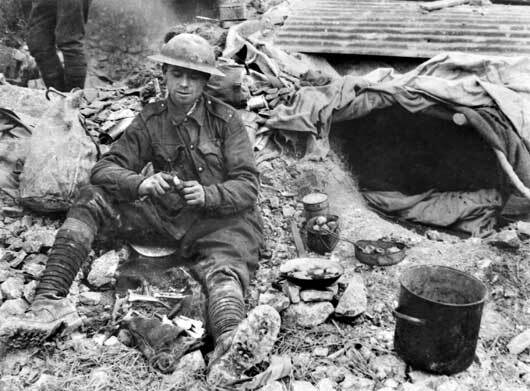 Private A.G. Townsend, 46th Battalion, making a meal of vegetables salvaged from a ruined garden (AWM E02185). 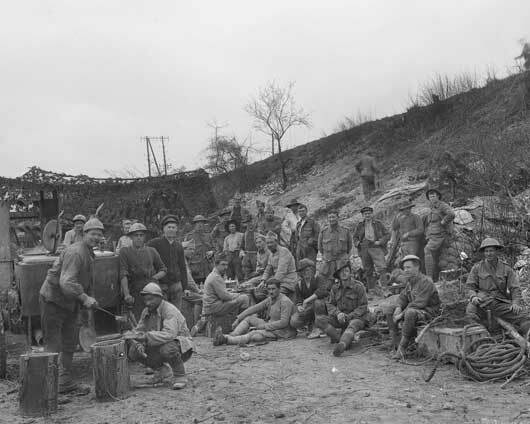 A camp shared by French gunners and Australian pioneers of 4th Division near Villers-Bretonneux (AWM E02192). Members of the 52nd Battalion at the burial of Major William Alexander Craies, mortally wounded by a sniper following the Allied counter-attack on 24 April (AWM E02259). Meal time at a machine gun post of the 5th Australian Machine Gun Battalion on Hill 104 (AWM E02296). 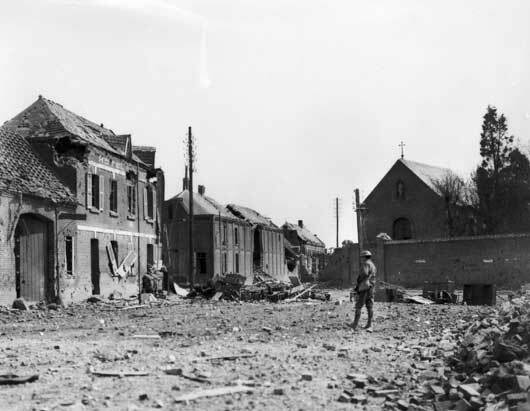 The remains of a barricade in a street at Villers-Bretonneux, after the town was recaptured by Australians (AWM E04880). 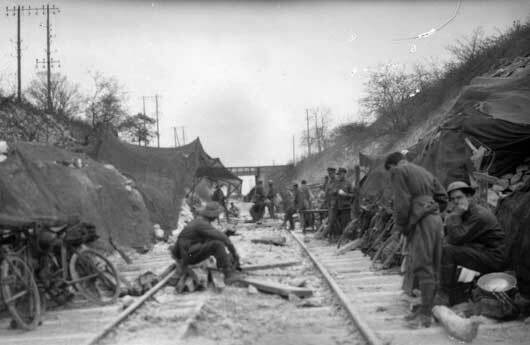 A view of the railway cutting near Villers-Bretonneux, where Brigade Headquarters was located (AWM E04881).